Some technology is surprisingly ancient. Concepts and machines we might think were invented recently are actually thousands of years old. The Romans conquered the Ancient Greek city of Syracuse over 2,200 years ago, in 212 BC. During the sack of the city a Roman soldier killed antiquity’s greatest scientist, Archimedes. The killing was against the soldier’s orders; the Romans had hoped to capture the 75-year-old Archimedes alive. They respected him as the world’s most brilliant thinker. His war machines had held off Syracuse’s Roman besiegers for years – they finally entered Syracuse only by trickery. The Romans hoped to utilize Archimedes’ talents for their own purposes. The Roman General Marcellus removed certain items from Archimedes’ home. Many years later, one of these items was seen in the home of Marcus Marcellus, General Marcellus’s grandson. Of all the wealth plundered in Syracuse, General Marcellus had kept only this item for himself. …I concluded that [Archimedes] had been endowed with greater genius that one would imagine it possible for a human being to possess. For Gallus told us that the other kind of celestial globe, which was solid and contained no hollow space, was a very early invention, the first one of that kind having been constructed by Thales of Miletus, and later marked by Eudoxus of Cnidus… with the constellations and stars which are fixed in the sky. But this newer kind of globe, he said, on which were delineated the motions of the sun and moon and of [the five visible planets] contained more than could be shown on the solid globe; the invention of Archimedes deserved special admiration because he had thought out a way to represent accurately by a single device those various and divergent movements with their different rates of speed. And when Gallus demonstrated the globe, it was actually true that the moon was always as many revolutions behind the sun on the bronze mechanism as would agree with the number of days it was behind in the sky. Thus the same eclipse of the sun happened on the globe as would actually happen, and the moon came to the point where the shadow of the earth was at the very time when the sun . . . out of the region . . .
Actually, in his book De Natura Deorum, Cicero tells us of a more recent spherical mechanism made by the great Greek polymath Posidonius, who lived between c. 135 BC and c. 51 BC – in the same era as Cicero. It might have seemed too much to hope that one of these devices would be found in modern times, but one has; and from it modern scientists have discovered how remarkably sophisticated and knowledgeable the Ancient Greeks really were. In 1900, off the Greek island of Antikythera, sponge divers found the wreck of a large Roman ship. One of the items recovered is known as the Antikythera mechanism. The technology in the device, which is dated 200 – 100 BC, is truly remarkable, calling to mind the device removed from Archimedes’ home by General Marcellus. 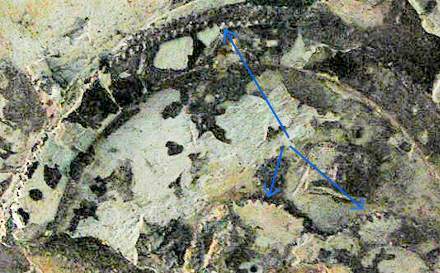 The blue lines point to finely crafted gear mechanisms in the Antikythera mechanism. Image by Marsyas. Brilliant work by multidisciplinary teams and individuals has revealed that the Antikythera mechanism was actually a mechanical analog computer, predicting future solar and lunar movements, eclipses, and planetary movements. The Antikythera mechanism is probably a different design from the ones Cicero described. 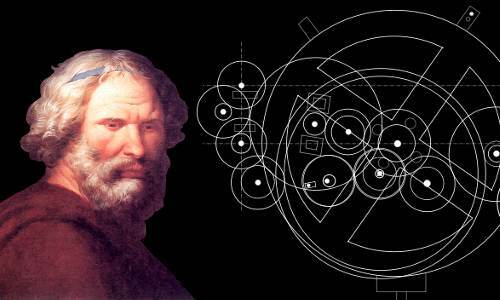 Cicero described spheres, whereas the external appearance of the Antikythera mechanism was box-like. The Antikythera mechanism’s gearing for the moon’s movements is particularly remarkable. The mechanism’s designer – an engineering genius – realized that straightforward circular gearing would fail to predict the moon’s acceleration and deceleration as it traces its elliptical orbit of the earth. Therefore the design utilized two gears and a pin and slot mechanism – all cut carefully from bronze – to produce different centers of rotation to simulate the moon’s orbit. This was a truly exceptional transformation of astronomical observations into mathematics into engineering into computing, far beyond anything science historians had previously believed ancient civilizations were capable of. Here are two beautiful videos showing reconstructions of the gears and how the Antikythera mechanism might have operated. I´m using one right now. “There is nothing new under the sun (Ecclesiastes 1:9).” The Greeks and Romans had extraordinary inventions, but they lacked what we take for granted today: harnessed electricity and motor power. Can we imagine what their societies might have been like, if they had the resources to bring these into their realities? And where would we be today, if they had succeeded in those areas? We would be living in quite a different world. Which proves that throughout history (from the beginning of time up to the 21st century), all people have demonstrated approximately the same levels of intelligence and brain capacity! In short, we are all human beings. wish I could travel back in time to see what was going on with these machines and how exactly they were made, who was making them, and what other machines they were making.